When Bob invited me to join his family on a tour of the holy city of Kyoto and the tragic city of Hiroshima I could not say no. I was a duck and cover kid in first grade and had never forgotten the experience. It had motivated me to study the theory of nuclear decay in order to find out if the existence of natural semi-stable uranium in our universe was non essential as I had suspected for decades. I wanted to know if it could have been otherwise. If there was a creator, was there a choice in the matter. Could it have been a nuclear free universe in which the instant destruction of Hiroshima could not have happened? Six years before this trip to Japan I had finally found the answer to my question. If there was deliberation, it was a set up. If we choose to retain the kind of warrior ethos that produced two world wars, then we choose extinction. The trip from Tokyo on the bullet train was fun. Two monks from the city of four thousand shrines were amused when I slid down the hand rail at the station. The only hint of the serpent in the garden was the deliberately creaky floor boards in the empora's summer palace. They were the assassin warning system. After visiting an adequate number of temples and seeing the largest statue of Buddha in the world we set off for Hiroshima. For me it was a very different experience. Even though the city appeared to be young and vital, I started to disintegrate soon after leaving the station. The walk to ground zero was several miles and many indelible images. I dropped back from Bob, Betsy and Alex because I couldn't handle company. I came upon a flower stand and in tears I bought a bouquet for the dead whom I had yet to witness except in the media. Before crossing the river a mile from the shrine I noticed the first sign of what had happened. A distorted tree on the river bank had only a few branches that pointed away from the blast. On the bridge across the river I tried to give the flowers to a very elderly lady. Though we could not share words she made it clear that they belong at the shrine for the dead. When we got there, bus loads of happy school children were every where. But inside of the museum the atmosphere was solemn. The walls were covered with pictures of the destruction and human misery that had occurred in an instant. Horribly burned children were searching for the parents who could no longer comfort and protect them. A burned baby sat crying next to its dead parents. When I immerge into the sun light I was an emotional basket case. Children came up to me and said "its OK, its OK". But it wasn't OK . I left the flowers among many others. It was still not OK. We rang the Bell of Peace. It was better, but not OK. On the plane back to the states I wept again. I realized that my tears were not only for the children in the pictures but for my children and all of the children of the world of today and tomorrow. I realized that the only thing that could make it OK is if people learn their lesson in time. 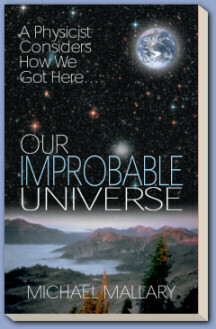 I then resolved to write Our Improbable Universe. I wanted people to see that they can not simply throw away existence after the universe overcame so many hurtles to bestow it upon them.